The gray lady and the search giant join forces on a new virtual reality app and a big distribution deal. New York Times subscribers may soon notice that their paper is thicker than usual, with a Google Cardboard virtual reality headset stuffed inside. On the weekend of November 7, Cardboard will be included with more than 1 million home deliveries of the Times’ print edition. Times Insiders and some online subscribers will also get an email promo code for a free Google Cardboard headset. Like the name suggests, Cardboard is a lightweight virtual reality system made out of folded up cardboard with a pair of attached lenses. Once assembled, users can slide an Android phone or iPhone behind the lenses, and look through a pair of eye holes to experience virtual reality apps. Most apps allow users to turn and move their heads to view virtual worlds from different angles. Existing Cardboard users should also be able to watch the films for free without a copy of the New York Times. 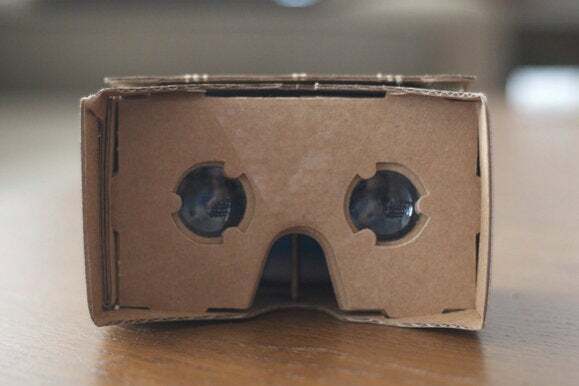 As for people who don’t have Cardboard, the Times says the NYT VR app will still offer “an enhanced video experience that opens a window into the virtual reality environment.” The videos will also be shown in 2D on the Times’ website. Why this matters: Google’s virtual reality hardware is as low-tech as it gets, standing in stark contrast to the slick headsets and fancy new input methods coming from Oculus and Valve. But with the Times collaboration, Google is taking full advantage of Cardboard’s cheapness by slipping it into newspapers. Now we just have to see how many print readers are willing to spend time inside virtual worlds.